In October 2018 Antero Midstream GP LP (AMGP) and Antero Midstream Partners LP (AM) announced plans for AMGP to acquire AM in a stock and cash deal. In connection with this transaction, AMGP converted into a corporation, was renamed Antero Midstream Corporation, and began trading under the ticker symbol AM on March 13, 2019. Antero Midstream Partners LP public unit holders ultimately received a modest premium and will be more than made whole on their previously communicated distributions and growth profiles, according to management. In this note we will provide an overview of the combined company and take a look at Antero Midstream Corporation's dividend safety. The MLP industry has faced increasing pressure over the past five years, driven by the crash in oil prices, regulatory changes, and U.S. tax reform. These factors have largely soured investor sentiment on the MLP space, leading many of these partnerships to restructure their business models. 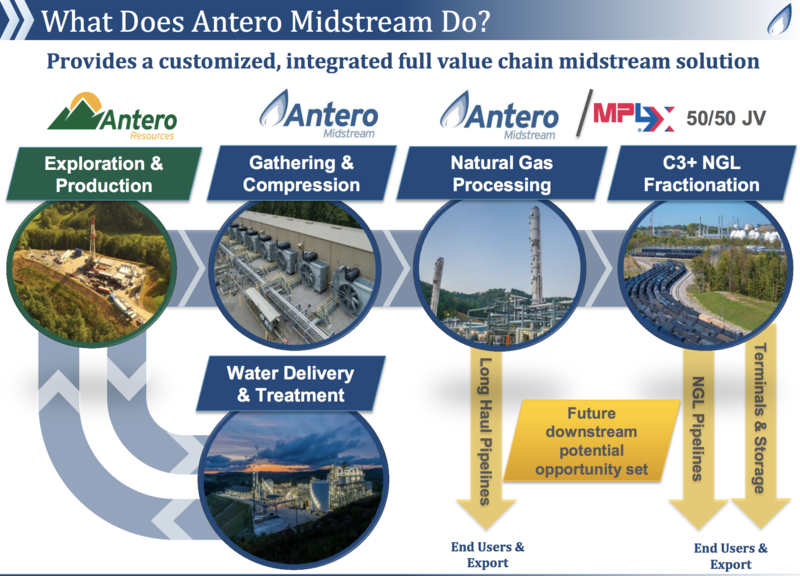 By converting into a corporation and eliminating its incentive distribution rights, or IDRs, Antero Midstream simplifies its business structure and reduces its cost of equity. Previously, you can see that Antero Midstream Partners LP agreed to pay out an increasing proportion of its distribution growth to its general partner, Antero Midstream GP LP. Eliminating the IDRs helps to ensure that shareholders will not miss out on the company's future growth opportunities. It also allows Antero Midstream to better compete for larger projects with other rivals that have already eliminated their IDRs. 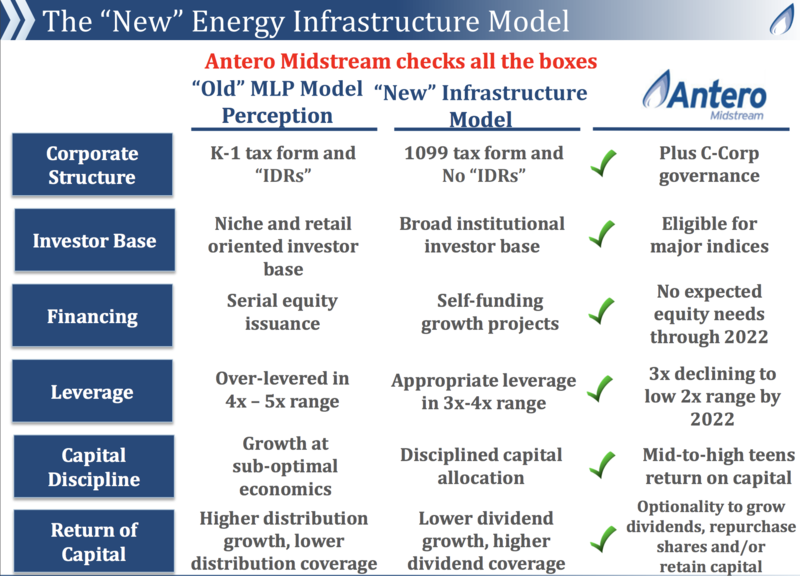 Overall, Antero Midstream hopes its simplification will expand its investor base, reduce its long-term tax burden, de-risk its growth financing, enhance governance and shareholder rights compared to the MLP structure, and basically allow it to run a more conservative business in general. "The acquisition of AM by its general partner Antero Midstream GP (AMGP, unrated) will add $600 million of incremental debt increasing the debt/EBITDA ratio of the combined entity to 3.2x from AM's 2.4x level at December 31, 2018. However, the transaction will also simplify the corporate structure, and reduce future distribution burden as well as the cost of capital by eliminating incentive distribution rights, partially offsetting the negative impacts of higher leverage." Similarly, the new Antero Midstream Corporation retains a "Borderline Safe" Dividend Safety Score. On a positive note, Antero Midstream's expected distribution coverage ratio and leverage remain reasonably healthy. The company's elimination of IDRs and ability to run a self-funding business model are positive actions as well. The main factors keeping Antero Midstream's score in our "Borderline Safe" bucket are its somewhat lower distribution coverage ratio, increased leverage, and continued dependence on one large customer, which operates a cyclical business. Starting with the dividend, management expects the company's distributable cash flow coverage ratio (similar to free cash flow divided by dividends) to sit between 1.1 and 1.2 in 2019. As you can see by the downward sloping green line below, that would be Antero Midstream's lowest coverage level since it went public in 2014. It's still a reasonably healthy coverage ratio, but a somewhat greater margin of safety would be preferable to improve the company's Dividend Safety Score. As for the balance sheet, as Moody's noted the company's debt / EBITDA leverage ratio will rise from 2.4 at the end of 2018 to about 3.2. Management expects leverage to remain below 3.25 by the end of 2019, with a decline to around 2.5 by 2022. Once again, the firm's leverage is reasonable, but improvement would be needed to increase its Dividend Safety Score. Finally, while Antero Midstream does not have any direct commodity exposure and depends primarily on fee-based revenue, investors should note that the company's distributable cash flow growth can vary depending on activity at its single customer, Antero Resources (AR), which is sensitive to commodity prices. Antero Resources is the largest natural gas liquids producer in the U.S. and the fourth largest natural gas producer in the country with approximately 3,000 core drilling locations. Antero Midstream's integrated midstream assets support Antero Resources' exploration and production activities. As Antero Resources grows its production, Antero Midstream's operations benefit from gathering and processing higher volumes of natural gas. However, Antero Resources' production growth ultimately depends on oil and gas prices. Lower prices result in less drilling activity. Should commodity prices sink lower, Antero Resources' production growth is expected to moderately slow. 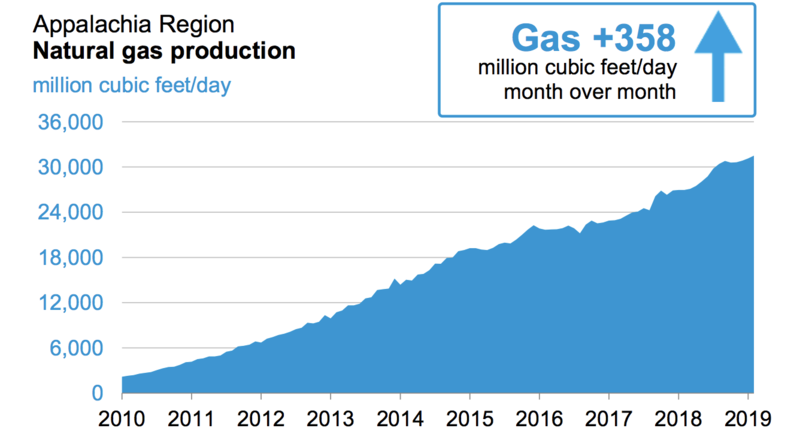 With all of its natural gas production operations focused in the fast-growing Appalachia region, Antero Resources is also banking on favorable shale market dynamics continuing like they have over the past decade. Fortunately, the company is 100% natural gas hedged in 2019 and 55% to 60% hedged on its 2020 production outlook, providing at least short-term support to its growth targets. 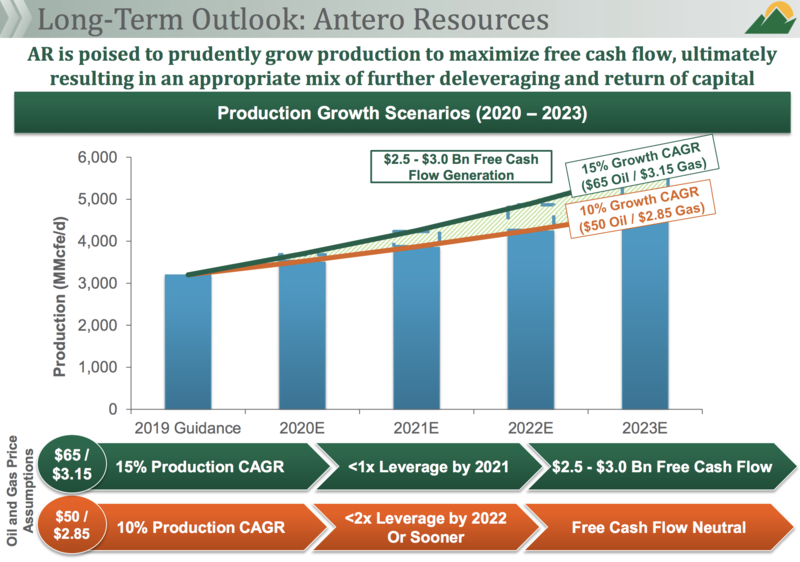 Due to the variability in Antero Resources' long-term production growth guidance, Antero Midstream also offers a rather wide range of targeted distributable cash flow growth. Management expects distributable cash flow to grow 18% to 25% annually through 2022. Importantly, due to the company's flexible just-in-time capital investment, both scenarios are expected to result in de-levering the balance sheet from 3.2 today into the low to mid-2 times range. Overall, Antero Midstream appears to have one of most impressive growth profiles in the midstream space. While simplifying its business results in somewhat higher leverage and lower distribution coverage, both of those important dividend safety areas should improve in the future if cash flow growth goes according to management's plan. Investors just need to remain mindful of the company's dependence on one customer and geographic region, as well as management's plans to continue investing heavily, albeit with a self-funding business model. From a data perspective, please note that the financial data on our website for AM will update with Antero Midstream's "new" financials once it files its first earnings report as a new company, likely sometime in May. Aside from stock price, currently the "old" AM's data is displayed. The same is true for the company's listed dividend on our website. As soon as the firm's new dividend is officially declared with the stock exchange, its information will flow through on Simply Safe Dividends. Management intends to pay a $1.24 per share dividend in 2019, implying a yield of about 9% today. 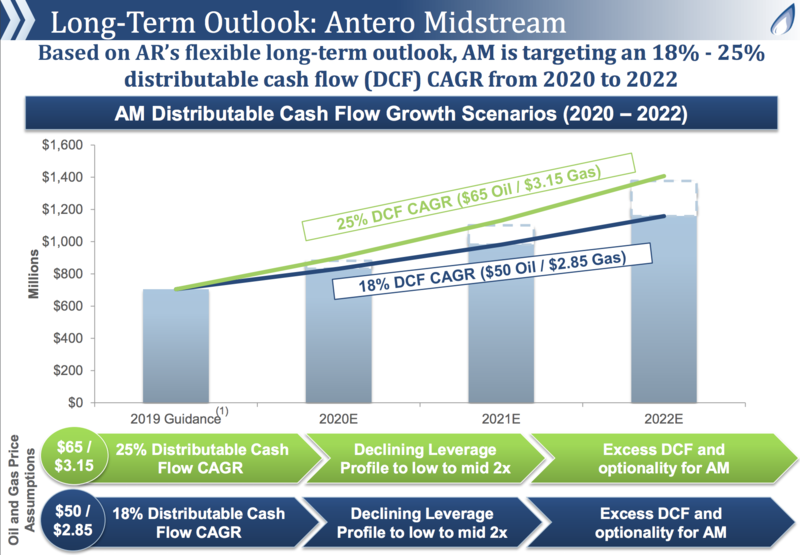 Antero Midstream's dividend should have solid growth prospects, although it likely won't keep pace with growth in distributable cash flow over the next few years as management works on deleveraging.